Racing starts at 9 a.m. daily. Single-day tickets expire one hour after the completion of racing. Anyone remaining and found by security will be asked to leave for the remainder of the evening and will not be allowed to purchase a next-day ticket until the following morning. Basic camping is included in multi-day tickets between days purchased. 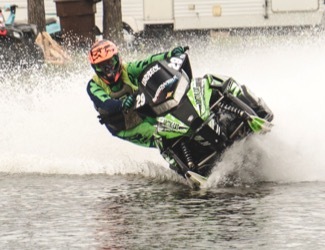 The Central Roadracing Association brings its insane brand of Superbike racing to Brainerd International Raceway’s road course, while the International Watercross Association’s snowmobiles are on Lake BIR for drag racing and oval racing on open water. The Wet & Wild Weekend 2.0 feature Superbike on BIR’s original 3.1-mile Donnybrooke Road Course and it’s famed mile-long straightaway and 10 turns. On Lake BIR, the snowmobiles skip across the water, seemingly defying gravity as they circle floating markers to compete in oval racing, starting and ending on shore. It’s a thrill a minute and great racing action. On-site camping is available, including full-service RV sites. Daily admission is $25. Kids 12 and under are FREE!